The four members of the Pitmen Poets have been busy since their last UK tour. Bob Fox joined the cast of Warhorse in the West End, Billy Mitchell has been touring UK theatres with The Lindisfarne Story. Benny Graham has been writing music for film and theatre and Jez Lowe has been nominated by BBC Radio 2 for Best Folk Song of the year for his composition - 'The Pitmen Poets'. Since the first Pitmen Poets tour in 2011, Sam West's revival of the seminal “Close the Coalhouse Door” has completed a triumphant UK tour and Lee Hall's “Pitman Painters” has been a hit in the West End and also on Broadway. Interest in Britain's and specifically the North East's mining tradition has never been more intense. The Pitmen Poets will be touring the UK again in January 2016. The Pitmen Poets celebrate the songs and culture of North East England's Coal Mining tradition, bringing together four of the region's leading champions of it's musical heritage. 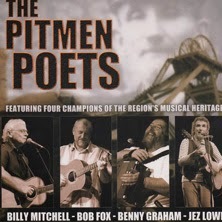 Ex-Lindisfarne singer and songwriter Billy Mitchell, renowned singer and instrumentalist Bob Fox, leading exponent of Tyneside song Benny Graham, and much-covered Durham songwriter Jez Lowe - individually and collectively, The Pitmen Poets. The show features music, song and spoken word and is illustrated with archive photographs. “The historic setting of New Hartley's Memorial Hall was transformed into an emotional hothouse during the concert by the Pitmen Poets. The audience sang along, laughed and also shared moments of sadness as the combined talents of Billy Mitchell, Jez Lowe, Benny Graham and Bob Fox took them on an epic journey through the life and times of the people who made their living in the Northumberland and Durham coalfields. What a memorable night!” Brian Coles – Rock of the North.